Here’s the good news: The big airlines are revising their rules for booking and boarding flights — rules that led to one of the great business fiascos in recent history, United Express Flight 3411. Here’s the bad news: If the long-term lesson that leaders of the airline business (or any other business) take away from this episode is that it’s time to rewrite policies and practices, to fine-tune bureaucratic procedures, then they will have missed a huge, perhaps even historic, learning opportunity. 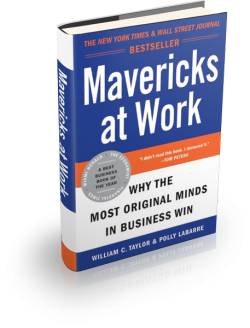 We all want to be part of a great organization and a high-performance workplace. We want to be at our best, surrounded by colleagues who help us and challenge us, doing work that is financially rewarding and personally meaningful. But there’s more than one kind of successful organization, and there are many kinds of productive workplaces. Bill and Melinda Gates just released their Annual Letter on the work of their philanthropic foundation. I look forward to the Letter every year, because it offers such in-depth, data-driven, easy-to-understand perspectives on how the ultimate power couple is addressing some of the world’s toughest problems. To me, spending time with the Letter feels like taking a master class on economics, statistics, demographics, and public health. But this year’s Letter is particularly powerful—and, truth be told, disconcerting. That’s because the world Bill and Melinda Gates describes seems completely at odds with the attitudes, priorities, and policies of Donald Trump and the new administration in Washington. I’m sure they did not intend their Letter to be read as some sort of political treatise, and I am not writing this to make a political statement. But for executives, technologists, and leaders of every stripe who want to build successful organizations and make a positive impact, it has to mean something when the two richest people on earth and the most powerful politician on earth see the world, its problems, and the best ways to solve them, in completely different ways. Here, then, are a few things that Bill and Melinda Gates see that Donald Trump doesn’t. Here in the United States, we’re just days away from Super Bowl Sunday. The buzz around the biggest game in America’s biggest sport is, as always, about more than football. It’s also about business and leadership. Does the Patriots’s consistent excellence over the last 15 years offer insights on teamwork that transcend football? Does Bill Belichick’s unrivaled record speak to his skills not just as a coach but also as a leader from whom others can learn? Even as high-minded a publication as The Economist gets caught up every so often in the connections between sports and business. A few years back, writing about a team that was dominating a different kind of football, the magazine claimed that FC Barcelona, the renowned soccer club, “has provided a distinctive solution to some of the most contentious problems in management theory.” Wow! So the question becomes: What can sports in general, and football in particular, teach us about competition and success, talent and teamwork, value and values? My answer, I’m afraid, is “not very much.” Sports, it turns out, are a terrible metaphor for business, and leaders who look to the gridiron or the soccer pitch for ideas about their work will be sorely disappointed. Here’s what’s wrong with making analogies between sports and business. These are head-spinning times for those of us who think about the best ways to lead and the most effective ways to compete. What defines acceptable personal behavior (let alone behavior worth emulating) among public officials? Why would executives at so many iconic organizations — Volkswagen, Wells Fargo, FIFA — tolerate behavior so egregious that it threatens the very future of their organizations? How should innovators with a fierce sense of ambition handle the criticisms and objections that inevitably come their way and make sure that confidence does not turn into bombast? Some of the most extraordinary innovations I’ve seen have taken place in the pizza business. Presenting at the Boston Properties University 2016. 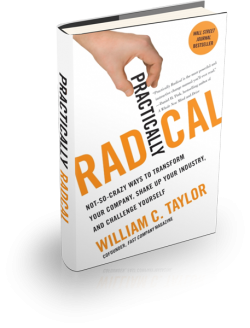 William C Taylor’s new book looks at all manner of unusual companies start-ups learn a lot from. 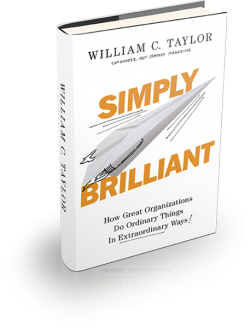 Sign up for Bill’s newsletter and receive a preview of his new book, Simply Brilliant. PLUS get INSTANT Access to Bill’s Resources.